Champaign-Urbana may be completely landlocked, but luckily for us there are plenty of options to satiate our significant sushi cravings. 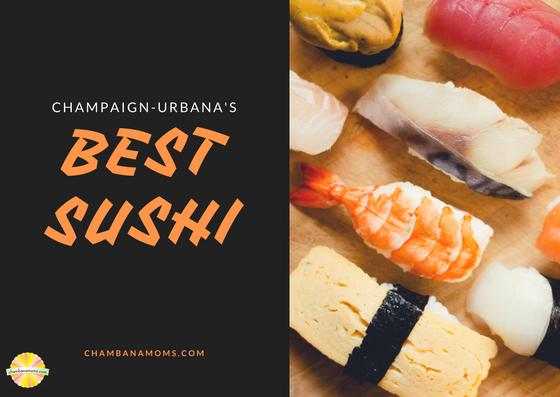 From restaurants to grocery store offerings, our readers weren’t shy about offering up Champaign-Urbana sushi recommendations via the chambanamoms.com Facebook page. Where do you like to eat sushi in Champaign-Urbana? Post in the comments below. Editor’s Note: Restaurant recommendations were supplied by our readers on our Facebook page and are not endorsed by Chambanamoms.com. Top restaurant recommendation: Sakanaya on Green Street. We’ve mentioned Sakanaya on the website a few times, notably on our list of great date night restaurants. Small but elegant, this is certainly a reason to venture to campus. Located on Greet Street, just east of Fourth Street. Tip: get a reservation if possible. See our Mom Review of Sakanaya here. Add your voice about sushi in the comments.